Conservators discovered a chemical hearth, part of an early science classroom, that had been sealed in one of the lower-floor walls of the Rotunda since the 1840s or 1850s and was thus protected from the 1895 fire that destroyed much of the building’s interior. In Jefferson’s original Rotunda, natural history professor John Emmet taught chemistry classes on the Rotunda’s bottom floor, a common practice then so that water required in the experiments would not have to be pumped up to upper floors. Laboratory experiments and demonstrations were conducted in the Lower East Oval Room and lectures were given in the Lower West Oval Room. The hearth was built as a semi-circular niche in the north end of the Lower East Oval Room. Two fireboxes provided heat, one burning wood for fuel and the other burning coal, and underground brick tunnels fed fresh air to fireboxes and work stations while flues carried away the fumes and smoke. Students worked at five workstations cut into stone countertops. Correspondence between Jefferson and Emmet shows that Emmet believed that students needed to perform their own experiments to learn chemistry, not just watch their professor. When the Annex was added to the north side of the Rotunda in the early 1850s, the chemistry lab was moved to the ground floor of that building, which later burned in the 1895 fire. The chemical hearth will be on permanent display in its original spot in the building. 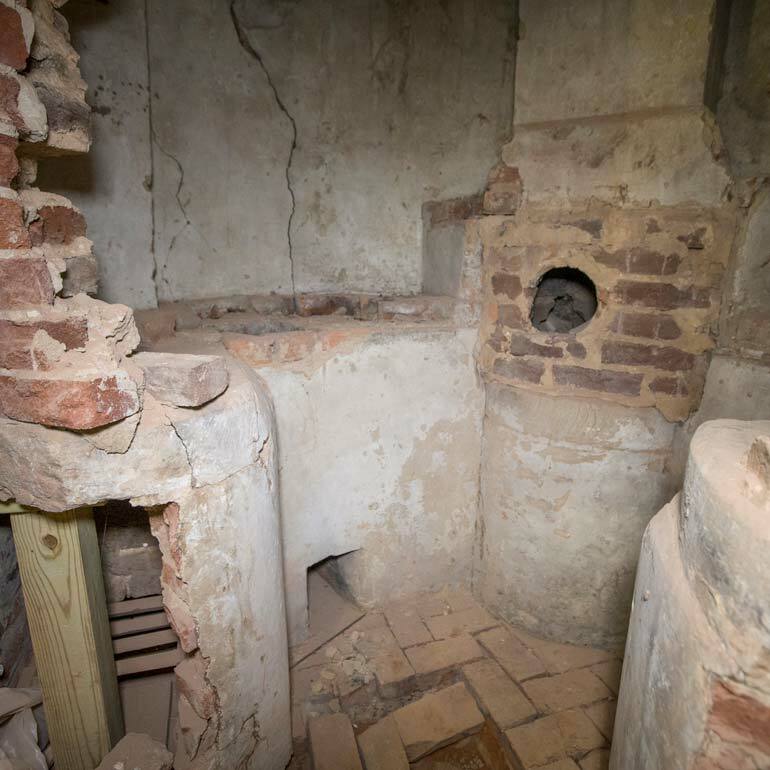 Conservation crews opened up cavities in the walls of the lower oval rooms in the barrel of the Rotunda in search of evidence of the building’s original design features. They found debris from the 1895 fire and subsequent reconstruction, including window glass melted and broken into pieces, and sheet tin that appears to be material from the roof. The shingle pieces were joined together with folded-over edges, a technique described by Jefferson and used on several roofs in the Academical Village, according to architectural conservator Mark Kutney. Before modern plumbing, it was a struggle to get fresh water up the hill to Grounds. The University bought Observatory Hill because it was covered with springs—a reliable water supply—and used cisterns to collect and provide supplemental water for drinking, fire protection and other uses, such as chemistry experiments. 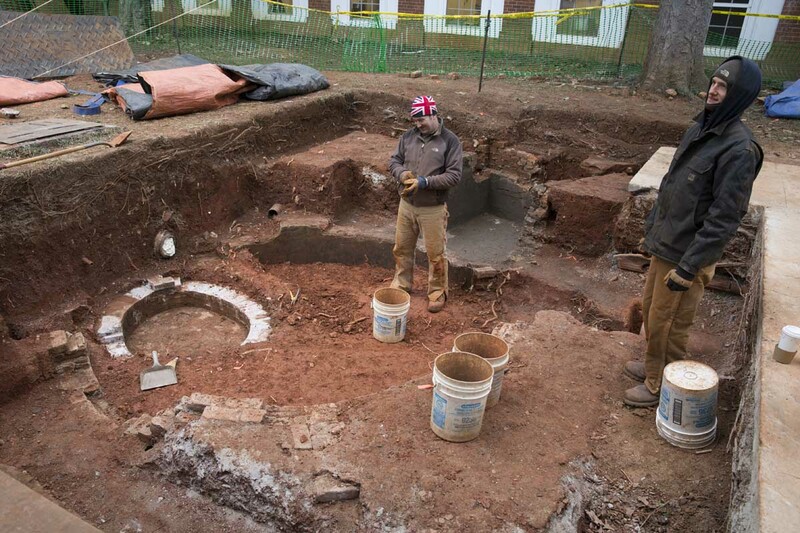 During the renovation, archaeologists from Rivanna Archaeological Services, LLC excavated an 11-foot-deep 6,500-gallon cistern—a round, underground tank with a brick exterior lined with a layer of hydraulic cement—on the east side of the Rotunda. It is believed that this particular cistern was used to collect and store rainwater from the roofs of the Rotunda and the south wing. Archaeologists sifted through about four tons of red clay soil that had filled the cistern for more than a century and found shards of china and a few pieces of quartz and concrete that had been used to pave Lawn walkways in the 1880s. They also found timber that may have come from the cistern’s wooden roof, and a carpenter’s axe head. Initially, archaeologists thought the cistern dated to the 1820s and was thus part of the Rotunda’s original infrastructure. But further digging—and the identification of a few names carved into the cistern brick and cement—led them to believe it was instead built in the 1850s. The Rotunda’s four cisterns were decommissioned in the late 1880s, after the University connected into the municipal water system. At that point, this cistern was filled in and its upper level destroyed over the years as the gardens were landscaped and leveled after the 1895 fire; a fountain was built over the cistern in the 1950s. University masons carefully removed sections of the cistern wall that may eventually be displayed in the building. Workers will preserve some of the cistern bricks to use in upcoming Academical Village repairs. Hogg says that archaeologists also found remnants of the Annex on the north side of the building, foundations and interior walls that help the architects and archaeologists understand the Rotunda building and its landscape in a way they hadn’t before. Excavation of the Lower East Oval Room floor uncovered remnants of two brick piers that apparently supported pillars that held up the floor above. Archaeological evidence suggests that they are original Rotunda features.